Ager Sonus is the second new addition to the Cryo Chamber roster in the last month. Yet, it is no less interesting than its predecessor, Legends of the Wood by Dead Melodies, reviewed here. Ager Sonus succeeds where many have previously fallen short in creating a near-eastern tale of mysticism and ancient esoterica. The album focuses less on concrete narration and more on atmosphere and suspense. In this way listeners are able to freely extract their own meanings and practical uses for the album. The barren landscape of an Egyptian desert invite us into this tale. As we travel “Through the Desert” the sounds of the abrasive sands can almost be felt, pelting our agitated skin as the sun cooks us from above like ants under a microscope. Feelings evoked from this opener are immediately dark, yet they seem to precipitate an even greater darkness to follow. This revelation of something more sinister to come is immediately justified by the following track “The Dead City”. “The Dead City” does an immaculate job of building an atmosphere of ancient abandonment by the world of the living. There is a hollow air to the track, with a magnitude of interesting hints and cues to hold our attention. While the city may be dead, there is yet a sinister afterlife with which it haunts. As Book of the Black Earth progresses, each track takes us further into the catacombs of this once illustrious city. A place which is now bleak and arid. The sounds of ancient stone grinding stone, sands scraping one more layer of history from the surface, these things give us that sense of loneliness, a sense of abandon. Yet, we can’t help second guessing ourselves. While the living may no longer reside here, the dead still walk these ruins. There is an afterlife radiating from this underworld. Sounds like the occasional near-eastern instrumentation or the sacral vocals of some long forgotten muse still haunt these passages. As if there is something still alive and terrible within its depths. The most important point about Book of the Black Earth is Ager Sonus‘ ability to invoke a true sense of darkness. Outside the feelings of isolation and abandonment, there is a distinct sense of evil, malicious elements to this story. Fear is evoked within each track, giving listeners no sense of relief at any point. Introspection is not necessary in such a dark setting. There is indeed little time to look inward when so much shadowy maleficence is right before our eyes. Book of the Black Earth is the perfect soundtrack to the reading of horror stories, playing video-games which take the player into the darkest realms of the human mind. The focus on atmosphere over narrative gives the album’s listeners room to take their own unique journeys in many different directions. The occasional use of instrumentation adds a sense of familiarity to the work, its gives us a foundation upon which to build our nightmares. Whether lying awake in the dark absorbing every note of music, or imagining the grinding of ancient stone upon abandoned surface, Book of the Black Earth is a portal to ghastly realms which much of humanity would prefer to be left forgotten. Listeners of the more cinematic varieties of dark ambient will be over-joyed with this release. There is enough cinematic work presented here to build numerous narratives. Yet, there is enough room for flexibility in the imagination to complement many other forms of entertainment. 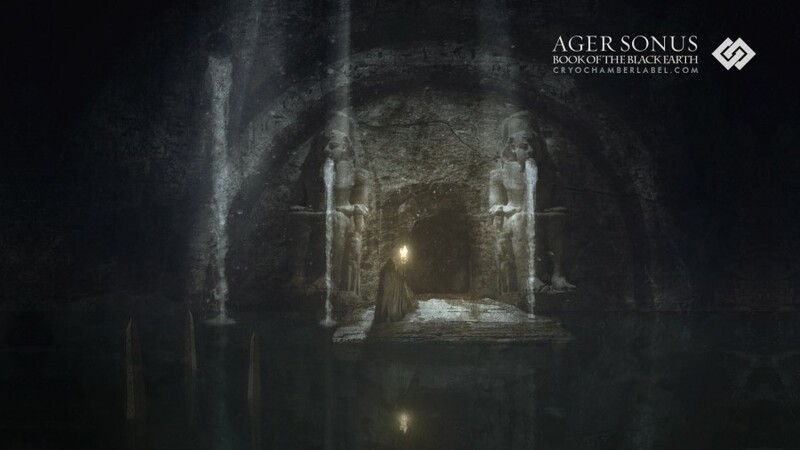 Book of the Black Earth by Ager Sonus, along with Legends of the Wood by Dead Melodies have given us vastly detailed works of cinematic art to enjoy for a long while to come. The darkness of these works are only trumped by their technical presentation. If malefic darkness and full immersion are your goals, this album will give ample reason to keep returning to its haunted and dusty tales of ancient antiquity.